The Tandana Foundation supports a wide variety of community initiatives, as well as intercultural volunteer programs in Highland Ecuador and Mali's Dogon Country. The tabs below give year-by-year summaries of our activities. Volunteers from the Ohio Master Gardeners joined Tandana for a week-long adventure to complete different gardening projects and cultural exploration. All week the group was accompanied by our knowledgeable, community friend, Matias Perugachi. They were able to help him work on his land and get dirty assisting with maintenance. The group spent three mornings working in Inguincho at the weather station planting medicinal plants and a variety of trees. Then, they were able to learn about the significance of the weather station to the area and the work that takes place. The group participated in a few afternoon cultural exchanges, learning about traditional dress and cooking methods, attending healing ceremonies and sharing meals and cooking with local friends. The group also had time to explore the Polylepis forest and learn about its unique ecosystem. On the final day, the group joined students and teachers at La Joya school to plant and enjoyed a snack and dancing together. Students from The Traveling School visited and stayed in homestays with the community of Agualongo for a week. During this time, the girls continued their general high school studies all the while experiencing Indigenous Otavaleño culture. They assisted local community members in cleaning drainage trenches on the main road and then in a community minga, started the third wall for the soccer field and moved dirt and rocks to level out the field. The girls expressed their thanks by sharing words and a memory followed by a song in English and Spanish. The experience was enjoyable for everyone and the girls left the next morning full of ways they had grown and would continue to navigate their semester of travel. Students from Parrott Academy began their week full of activities with a visit to Kawsaymi cooking school where they helped prepare a traditional meal and even tried a local delicacy- guinea pig. They spent their afternoons at the Panecillo school teaching art classes to the students. The kids loved making kaleidoscopes, giant paper flowers, seashell necklaces, and color-changing bracelets, and the group enjoyed practicing their Spanish to lead the projects. Additionally, the group contributed to 2 service projects- repainting the bathrooms, and painting a mural inside the school. On their final day at the school, the visiting students and Panecillo students played games and danced together. The event ended with a dance choreographed by the visiting students that the school dance group performed. The group enjoyed all of the activities that they participated in, but the highlight was working with students at the school where they made new friendships and hope to visit again one day. The Tandana Foundation welcomed thirteen students from the Northeastern University Alliance of Civically Engaged Students (NU ACES) for a week long service project in the remote community of Motilón Chupa. Their project for the next four days was to work with community members to dig out a new water containment system. Fortunately, the first day on site was a minga (a community work day that included a representative from every household in the community). The afternoons were full of interesting activities with new local friends, like participating in the carnaval tradition of a community-wide water fight. Everyone was soaked and loving it. Mama Maria taught us how to make local cheese and Maria Cortez treated us to fanesca, a traditional soup that is served around Easter. We worked hard and ate well. The inaugural group from Purcell Marian joined the Tandana Foundation in Ecuador on March 6th. The students and teachers quickly moved into their home stays in Agualongo and shared a week with their new families. They participated in three work days in the community cleaning the roads and putting in an drainage system for the soccer stadium. Students were able to learn about local indigenous Otavaleño culture while sharing meals and experiences every day. There was not a shortage of beautiful places as the group traveled to Lake Cuicocha, Lake Yahuarcocha and hiked up to a site to cook and eat lunch. When students were expressing gratitude and preparing to leave the community, an unexpected flight cancellation gave them three extra days. The extra days were spent visiting Taxopamba waterfall, a traditional cooking class, making bracelets, and a full day exploring Quito. The memories and friendships made will last a lifetime. The 25th Health Care Volunteer Venture kept us very busy. Our usual pace of 10 clinics in 10 days was tempered by some great afternoon adventures like visits to the local cultural history museum and to the home of our dear friend Margarita. Our clinic mornings took us near and far as we traveled to remote communities like Motilon Chupa and Muenala, mountain top locations with views (on a clear day!) of distant volcanoes and valleys below. But we also stayed close to town with a visit to nearby community La Banda. With so many returning volunteers, we got off to a running start and our team came together very quickly. We tried out a new afternoon activity with a local leather shop, La Tierra. Volunteers had a chance to try their hands at leatherwork and everyone created a small passport-sized leather carrying case. It was a wonderful way to shift gears from the busy rhythm of clinic and relax for a moment. We appreciate the flexibility and dedication of our volunteers! Tandana's ten literacy instructors have begun new classes with 300 students! They are excited to bring numeracy and literacy skills to more women in more villages in covered, open-air classrooms. To the right is a picture of nine of the instructors who will be teaching the classes this year. To learn more about the Literacy program in Mali please click this link and then click on the literacy and leadership tab. We are excited and anxious for them to get started! Representatives from the Olouguelemo Environmental Association's five new member villages and volunteers from nine additional villages learned how to make efficient cookstoves that reduce the need for firewood. Representatives of the new member villages also received bicycles and boots to help them in their conservation work in the protected forests. Leaders of the association also met with a contractor to survey the sites for the new stock ponds that will be created. To the left is a picture from the stove-making training session. The women’s association of Kani-Gogouna, one of the groups selected to receive funding for their new business, has used their funds to purchase sheep and get training on how to vaccinate them. To the right is a photo of some happy members of the association with their sheep. The Student Mothers Program exists because often times in Mali, when a female student becomes pregnant, she is unable to support herself and ends up having to drop out of school. The program was formed to support them through this critical stage of their development and allow them to continue to study. This year, the ten student mothers have received their food and supplies for this academic year and are ready to study. To the left is a picture of some of the mothers receiving their supplies. The literacy program has yielded some incredible results. 687 women are now considered to have basic literacy thanks to the classes. The literacy students who are members of Savings for Change groups have begun using notebooks to keep notes on their SFC activities, amounts loaned and owed, etc. Olouguelemo's two new tree nurseries are in the villages of Gongo and Sandian. The tree nurseries' managers received training on how to produce young trees. The nurseries provide native, medicinal, fruit-bearing, and soil-enriching trees for both reforestation in the protected forest zones and for farmers to plant in their fields. The Savings for Change groups in Kani held their annual fund-sharing ceremony in February. At the ceremony, each member receives her savings plus interest, which she can use to buy whatever she needs – whether it is seeds for a garden, cotton to transform into cloth, clothing, food for a special event coming up, etc. Also, The Kansongho village has elected a new committee to manage the grain bank for the coming year. The new committee members participated in a training session to learn their roles and have now assumed their responsibilities. The grain bank is extremely important to ensure that community members can afford to buy millet at an affordable price all year round. The fence is erected for the orchard of the school in Kilegou. The teachers and students have also received training in horticulture so that they can maintain this project on their own. This garden will help maintain a nutritious diet and also provide students with produce that they can sell in order to buy school supplies. The trend of school gardening is gaining strength and it seems that whenever school officials visit another school and see a garden, they would also like to have one. The new furniture for the school in Sal-Ogol, Mali, has been finished and delivered by members of the Kansongho carpentry workshop. The furniture was delivered using the workshop's motorcycle. This furniture will ensure that schoolchildren have a comfortable place to sit and learn. Construction of the storehouse for the grain bank in Dologou is complete, and the members of the bank’s management committee have received training. The management committee purchases a large stock of millet and sells it at a constant price year round so that residents can afford it when they need it. The second phase of the Literacy Program is progressing quite nicely. After attending the Leadership and Association Governance workshops, the women leaders returned home and created women's associations in each of their villages. Each association came up with an idea for an income generating enterprise. Two representatives from each association were chosen to present proposals for their enterprise ideas at workshops. At the workshops, the women had a chance to learn about each idea and evaluate each proposal. A committee selected the best proposals, using a scoring system based on 20 criteria, and they eliminated groups from villages that have already benefited from Tandana support for income-generating enterprises. They gave special mention to the association from Guinekanda for their innovative business proposal. This association will collect seeds of the Néré, or African locust bean, tree. They will cook and ferment them to make them into balls that are used in preparing sauce for meals. This ingredient is used in almost every meal, so the balls are sure to sell well. The other proposals selected include transforming cotton into cloth, indigo dyeing, and raising sheep. The new cotton bank in Dana Guiri is called the Papa Hubert cotton bank because it honors the generous donations of Tandana friends and family members who gave in memory of Ed “Papa” Hubert. The construction of the building for the cotton bank is complete, and the bank’s management committee has also received their training. The village of Biné has joined the Olouguelemo Environmental Association as its sixteenth member village. The nurseries in the villages of Gongo and Sandian are doing well. The nurseries currently have 90 moringa trees, 27 tamarind trees, 126 pomegranates, 42 balanzán trees, 60 guayabos, 75 detarros, 9 palm trees and 55 chirimoyas in existence. On January 7, Tandana hosted ten students and two leaders from Colgate University for a service-learning trip. The students stayed with host families in Muenala and worked together with the community on the construction of a second floor for their community center. This program culminated in a heartfelt farewell party that included presentations and activities planned by both the community and the students; and of course, many tears were shed! Ohio Master Gardener volunteers joined Tandana and several of our community partners for a week-long adventure of gardening and cultural learning. They collaborated with the Motilón Chupa community - planting vegetables in the school garden and fruit trees on land shared by the Motilón community. They also planted in the garden at La Joya School for children with special needs. A group of girls from The Traveling School visited Ecuador and stayed with host families in the community of Agualongo. During this time, the students continued their general studies while experiencing the local indigenous Otavaleño culture. They also visited Saminay high school in the mountains surrounding Otavalo in order to assist the students in a reforestation project. Towards the end of the week, the students and their families went on a trip to a local Afro-Ecuadorian community, El Juncal, located in the nearby Chota Valley. Northeastern University in Boston joined us in Ecuador for an immersion experience. The small group of students, on an alternative spring break trip, visited for a week to live and work in the mountain community of Motilón Chupa. The students, along with project foreman Alberto Panama and other community members, helped build an 8x8x10 ft. concrete water tank. The tank improves the community's irrigation system. The Tandana Foundation was delighted to welcome a group of students from George Washington University in Ecuador. They spent most mornings helping the local community, Guachinguero, improve a multipurpose building next to their soccer field. This building serves as a center for the community, especially in the month of June, when they organize a large multi-community soccer competition. In April, Tandana hosted 7 volunteers in a very special program. As close friends and relatives of Tandana in the United States, the participants of this program had the opportunity to form friendships with the Tandana family in Ecuador. They painted together with the community of Muenala in a two-day "minga", a collective work in which the families collaborate in a community project. The volunteers also spent two days building new cabinets at the special needs school, "La Joya". Over the course of a week-long program, Tandana partnered with local and international volunteers to provide basic health care in 5 communities in Ecuador's rural highlands. Larcacunga, Motilón Chupa, Achupallas, Muenala and La Banda opened their doors to receive our volunteers and organized mobile health clinics with enthusiasm. Program participants also, in turn, gained from the genuine friendships they formed in and with Tandana's community partners, learning from their local knowledge and culture in medicine, agriculture, cooking and history. A group of 13 people from the University of Cincinnati joined Tandana for a week in May to participate in a number of education-based activities and projects. UC students split into three distinct groups who had previously prepared a curriculum on a range of topics to present to several different local schools. The UC students observed classes at the schools to understand the dynamics of classrooms in this area. After observing, each group presented their lessons on weather, sports, and scientific method, respectively. Challenges were faced, lessons were learned and open minds were filled with information that helped broaden the perspectives and perceptions of the world and those who inhabit it. Colgate University students joined Motilón Chupa's families, together renovating the community school. During two weeks of collaboration, they added new paint, fixed holes in the walls, replaced broken windows, and painted an educational mural. In addition, Colgate students lived with Motilon's families, sharing daily life with their new friends. Working hard and having fun through a variety of activities, everyone involved formed strong friendships through the time they spent together. Tandana appreciates Motilón's collaboration and Colgate's investment of time and energy as we all come together to learn and grow. The Kichwa community of La Banda hosted students from Dayton, Ohio, in a week-long collaboration to improve the community's water system. They all worked together through "mingas" (community work days), built a retaining wall in the La Banda water tank, and dug a new line for the water system. Visiting volunteers also learned about the local culture as they spent time with our friends in La Banda and the surrounding area of Otavalo. This year's Summer School program began on July 9 and ended on August 3. Approximately 53 students between the ages of 10 and 16 attended this year's program. The Summer School Program Director and four ESL interns taught English and elective classes. A theater professional returned for another summer and taught the students all about acting and public speaking. Some of the electives included science, yoga, basic theater concepts, storytelling, and art. Two university scholarship students helped teach math and dance. This year's program took place at the Ati Pillahuasu School in the community of Panecillo. Highlights of this year's program included painting a mural at the school (right), visiting the Living Kichwa Museum in Otavalo, and performing a play on the last day. This summer, a group of Lakeside School students joined Tandana for three weeks. During their stay, the students lived with host families in the Agualongo. While there, the group helped the community build a fence around their soccer field to solve the continuing problem of cars damaging the field. The students also participated in a series of cultural activities involving the community, including baking bread in one of a large brick oven, listening to the stories of the haciendas surrounding Agualongo, and climbing to the top of a mountain to spend a day roasting food and flying kites. For two weeks this fall, our largest team ever assembled to provide health care to 12 total communities in highland Ecuador over a two-week period. About 60 foreign volunteers, local staff members, and local professionals all came together to visit 10 different villages while transportation was provided to two nearby villages so they could also attend. It was a great success and over 1,000 patients were seen. When the team was not providing basic medical care they could be found visiting with Tandana friends who live in the area enjoying local attractions. For a week this fall a small but hardy team of dedicated volunteers worked at the community center and school property in the community of Padre Chupa. They put their green thumbs to work alongside local community members, planting medicinal plants, ornamental plants and fruit trees on the property surrounding the school. Lime trees and tree tomato trees are now growing and will one day provide food to help supplement the school lunches. In order to keep these plants strong with sufficient water, the team also installed a section of pipe that brings water from a tank above down to the school garden for irrigation. It was a wonderful week and the end was marked with a heartfelt ceremony led by Don Matias. During their week with Tandana in Otavalo in late October and then again with another group in late November, 9 ARCC students and their 2 leaders spent their time in the community of Minas Chupa. Students worked side by side with community members, remodeling the community center in a series of mingas (community work days) for four mornings. The project involved plastering all the inside walls of the structure, covering the floors with cement and giving the walls a paint primer coat. They also enjoyed several activities in the area, including a hike with the president and several kids from the local school, spending an afternoon learning from the mothers in the community how to embroider beautiful designs, and making bread to be eaten with a golden berry colada/ drink. The week culminated with a ‘despedida’ in Minas Chupa including a lot of delicious food and dances with community members! The McJunkin and Nelson families joined Tandana for an exciting, and inspiring, start to the New Year. They worked in collaboration with the special needs school in La Joya, to decorate didactic furniture. The mini-sized benches, chairs, and table will be used as interactive classroom tools to teach the students house-keeping and daily living skills. The McJunkins and Nelsons were welcomed into the homes and communities of Tandana friends and formed impacting relationships. Twelve motivated Ohio Master Gardeners took part in a week-long volunteer venture. They jumped right in to working at a meteorological station in Inguincho, planting about 200 plants around the station. Most of their time was dedicated to clearing weeds and grass and planting a medicinal plant garden at the medical center in Quichinche. The participants worked together with community members and medical staff to weed and plant about 150 plants. They spent time in the afternoons doing activities such as visiting a museum about Kichwa culture, visiting a crater lake, and visiting the Polylepis Lodge, among other fun activities. Twenty members from Parrott Academy spent 5 days in Panecillo helping construct a wall behind the school and closing off the bathrooms and kitchen at the community center. They spent time in the classrooms teaching songs and doing crafts, as well as mixing cement and moving blocks and rocks, none of which were easy tasks. In the afternoons, they spent time learning about local culture at the Otavalango museum, learning about traditional dress and learning to make a traditional meal at the cooking school. They even went on a long hike with rewarding views. For one week of their semester-long trek through the Andes Mountains, 14 students and 4 teachers from The Traveling School stayed in the rural Ecuadorian community of Agualongo for a cultural immersion experience organized for them by Tandana. The students stayed with host families in Agualongo in early March. The immersion experience gave them opportunities to work in the community, learn about the community's history and spend time with their host families. As part of an Alternative Spring Break Program, 13 students and 1 university rep from Northeastern University spent 6 days participating in a group service project organized for them by Tandana. From March 4th-10th, the students worked with community members in Guachinguero to help build the walls of a new multi-purpose community center. Most of the building's exterior walls are up as well as a few interior walls. Building the walls involved sifting sand, mixing cement, placing blocks and filling in the empty spaces between the blocks with cement. 14 students and university reps from George Washington University joined the community of Guachinguero building a multipurpose center. They spent the week sifting sand, mixing cement, and helping finish off the first floor. They also were able to spend time in the classrooms doing activities in both English and Spanish. They learned about local culture at the Otavalango museum, made dreamcatchers in a community home, learned to dance salsa and took part in a cooking class. They topped of their week celebrating the day of San Jose, dressing up as vegetables and fruits and dancing in the pregón. From March 25th to April 8th, a team of 25 volunteers worked alongside Ecuadorian medical professionals providing medical care to 875 children and adult community members in 10 different rural communities surrounding the city of Otavalo. It was a busy two weeks for the team. Every morning, they visited a different community to set up a health clinic. The volunteers treated 405 medical patients and 432 dental patients. They conducted 196 vision screenings, and 279 children received a pediatric checkup. Tandana's Scholarship Program in Ecuador –Tandana scholarship student Gladys Perugachi graduated from University and has officially become a lawyer. She is currently practicing law in Otavalo. Gladys specializes in land title cases. From left to right: Vero Pazmiño, Tandana's Scholarship coordinator; Don Vicente Pazmiño, Tandana's Logistics Manager; Gladys Perugachi, holding the certificate; and Anna Taft, Tandana's Founding Director. 11 students and 2 faculty members from University of Cincinnati spent a week in different schools practicing lessons and observing the Ecuadorian education system. They taught all ages, from kindergarten to high school, about, physical & mental health, hygiene, and dreams & future planning. They also spent some time in La Joya, a school for children with disabilities, playing with the kids and lending a hand to the teachers. In the afternoons, they participated in cultural activities such as the Kichwa museum, cooking school, learning about traditional dress, making bracelets, and hiking to an ancient Incan Grotto. 10 students and 3 professors from Colgate University spent two weeks in Tangali, working on a community tourism initiative. They painted a building that will be used as an information center, stained the posts, dug a trench to provide electricity to the building and helped decorate a wall next to a gate that was put in to control who was going in and out of the area. When the students weren’t spending time with their host families, they participated in cultural activities. Overall, the students had a jam-packed yet very fulfilling two weeks. 15 REACH students joined us in Ecuador for 19 days. Students stayed with families in the community of Agualongo and worked together to build a retention wall for a water tank, repair the community’s water tubing, paint and construct a floor in the new community center, and carve out a new and safer footpath to the nearest bus stop. REACH also provided a generous donation for the community’s dream of improving the communal sports field. In addition, they also enjoyed the adventures of waterfall and volcano crater hikes, cooking classes of traditional kichwa cuisine, traditional weaving and salsa dancing classes, and a bonfire party on July 4th, where the students were able to exchange their own culture with the entire community of Agualongo. 16 students from the REACH program spent two weeks in the community of Agualongo, in the second installment of this REACH cohort’s cumulative experience in Ecuador with Tandana. The group spent a week teaching a variety of interactive classes in Tandana’s summer school, including food science, music, painting, and P.E. The following week, they focused on projects in Agualongo, including finishing a drainage ditch to secure the side of the road in the rainy season. The students learned about Agualongo’s history and continued close ties with Hacienda Perugachi, and participated in a variety of immersive activities with the community. Eight Lakeside School students and two program leaders spent three weeks working and experiencing daily life in the rural community of Tangali. The students worked side-by-side with the community members to start building a community kitchen. They moved materials, mixed cement and sifted sand. The students also placed bricks to build the kitchen's walls, and they helped put up the support for the ceiling. The students also organized a five-day summer camp for about 35 children, ranging in age from 4 to 17 years old. They students prepared science, English, art and sports lessons, as well as other games and activities. Tandana teamed up with local and international medical volunteers from all backgrounds to provide a week's worth of mobile health clinics. They visited 5 different communities over the course of the week, and were able to support nearly 350 individuals with free medical and dental care. What further marks Tandana, however, is the foundation's commitment to follow up with patients who cannot receive all that they need in the short time of a clinic; our professional medical providers referred many patients to continue in our Patient Follow-Up Program, through which Tandana staff will help them navigate the public health system and obtain their necessary treatment. Participants enjoyed learning from all the richness that the local culture and people have to offer. They took part in activities such as local museums, visiting master weavers, hearing local legends at a volcano crater lake, and cooking a meal at a family-operated cooking school. 11 volunteers joined with Tandana and friends from the Quichinche Parish to support several gardening and environmental projects. Over the course of the week, they worked with the students of a local high school, Saminay, in their school vegetable gardens. The harvest provides nutrients for the school lunches, while also providing agricultural and nutrition training for the students. They also joined Quichinche’s health center, to help continue their medicinal herb garden and promote the cultural integration of traditional and western medicines. Two separate groups from Adventures Cross Country teamed up with the high school in Inguincho named Saminay, in order to engage with local students from rural communities. They donated and helped to organize a number of books for the school library, and in addition helped teach in English classes, cook lunches, work in the school gardens, and spend time learning with and from the school’s inspiring students. They also participated in a number of cultural activities, from hikes to trout farms, milking cows, and cooking traditional food with local families. Grain Bank in Sal-Dimi – During the annual meeting to evaluate grain bank operation, the village assembly congratulated the committee on their great management of the bank. The community members asked the committee to continue selling the remaining 6 sacks of rice that they have in stock and to purchase 2 tons of millet to sell throughout the coming year. To the left is a picture taken at the evaluation meeting. Carpentry Workshop in Kansongho - The moto-tricycle purchased for the carpentry workshop is now being used. Two drivers received training on how to operate the moto-tricycle and are now using it to transport purchased materials to the workshop. To the right is a picture of the moto-tricycle. Community Meeting Room in Kansongho, Mali - A great inaugural ceremony was held for the building on April 8th. The members of the Ologuelemo Environmental Association, the community members, and the local authorities are thrilled to have the building in use. To the left is a picture from the inaugural ceremony. School Garden in De, Mali -There was another bountiful harvest from the garden. The students shared some of the vegetables they harvested with the school and sold cucumbers, lettuce, and cabbage for around $36. They used $27 of this money to buy chalk and notebooks. Well in Ologuine, Mali – Community members are thrilled that the well is finished. There was water in the well throughout the entire dry season so that villagers completed the well's clean raised opening. The opening includes a trough for watering livestock. Savings for Change Program – Two savings groups in the village of Yarou Plateau held their annual fund-sharing ceremony. They divided the group fund among all the members, which will allow each member to buy her bean, sesame, and peanut seeds for this rainy season. Then they started saving again in their weekly meetings. Their combined funds were over $1600, and each member received approximately $30 as her share. Now in December women in 15 more villages have asked Tandana to bring the program to their villages. Olouguelemo Environmental Association in Mali – There has been an early and large harvest of gondo fruits, in the forest surrounding several member villages of the Olouguelemo Environmental Association. Gondo fruits attract wild animals to the area and are good to eat. The villagers believe that the good harvest is thanks to the care Olouguelemo has taken of the forest and the association's work in assisted natural regeneration of trees. Grain bank in Kansongho, Mali – The bank is operating well and is selling millet and rice to community members at a reasonable price. The bank currently has 11 sacks of millet and 20 sacks of rice in stock. The bank's management committee recently met. Literacy Program in Mali - All 30 villages have completed the continuation course. Out of 837 students, 687 achieved basic literacy. Our partner organization AFTCD/PD has translated literacy and governance booklets into Tommo So to be used in the workshops that will be the next phase of the literacy program. Kansongho Cotton Bank - The Kansongho cotton bank is doing well. The sales and purchases are proceeding as intended and thanks to this project all of the women of Kansongho have access to cotton. They are also happy about the completion of the meeting room, because it has freed up their cotton bank building from being used as a meeting room for other village events. Kansongho Orchard and Garden - The Kansongho orchard and garden are doing well. The committee made about $100 by selling pomegranates, lemons, and other fruits from the orchard. Ondougou Township Indigo Bank - The indigo bank is doing well. The committee is managing sales and purchases very well, maintaining their fund successfully. The only challenge is that the 100% organically-dyed cloths are not selling well, and for that reason, most women continue to use mixed organic and chemical dyeing techniques. Sal-Dimi Cotton Bank - The Sal-Dimi cotton bank is doing well. As in Kansongho, the committee is managing it well, and all of the women have access to cotton to work with. Yarou Plateau Cotton Bank - The cotton bank in Yarou Plateau, like the others, is a success. The women of Yarou Plateau were able to use income from the cotton sales to buy materials for a collective ceremony. School Garden in Yarou Plateau - The harvest from the garden was great this year. In addition to using some of the vegetables for the school and sharing some of the vegetables with the local authorities, the students sold potatoes, onions, lettuce, tomatoes, peppers, and jujubes from the garden for about $26. They used about $19 of this money to buy notebooks, pens, pencils, and pencil sharpeners for all of the students. They are very proud of buying their own school supplies without having to ask their parents for help. Also, Ele, the teacher Tandana is supporting at the school is doing well. Tandana pays part of Ele's salary and the village pays the other part. Since the village knows Tandana’s payment to him depends on their contribution arriving, the village now pays him their part on time. Prior to this, the village did not pay him when they were supposed to. Now, the school has 3 teachers. Teachers always try to get transferred away from Yarou Plateau to other places because it is so remote. Ele is local, so he will provide more stability. The regular teachers have been going on strike because the government does not pay them regularly. Since he is paid by the village and Tandana, Ele keeps working during the strikes and teaches all three classrooms of students in 1st through 6th grades. He also takes care of the school garden and organizes the watering groups. Student Mothers Program – Tandana's student mothers program provides young mothers from rural villages in Mali the opportunity to continue their middle school education. Mothers enrolled in this program receive food for themselves and their babies for the school year as well as supplies and first aid care for their babies. The students have to live with host families in Bandiagara because there are no middle schools available near their own villages. This program also provides training to the host families on how best to support the students. Our staff in Mali has received the end of year results for the students that Tandana supports. Of the two students in the seventh grade, one moved up to the eighth grade. Of the four students in the eighth grade, three went on to the ninth grade. Two of the four students in the ninth grade passed the exams and received their middle school diplomas. While these results may not seem impressive at first, it is important to keep several facts in mind when considering them. On average, only 60 percent of the students in Mali move on to the next grade, and other students have to repeat grades. These statistics are for students who do not have to deal with being a young mother on top of keeping up with their school work. Without Tandana's help, these 10 students would have dropped out of school entirely. Now they have a chance to continue their education. In December, Tandana's Founding Director, Anna Taft, and her husband, John, flew to Dakar, Senegal to meet with Mali Program Manager Moussa Tembiné and Mali Local Supervisor Housseyni Pamateck. Since there is still an active travel warning for U.S. Citizens in Mali from the U.S. Department of State, they chose to meet in a 3rd party location that could ensure safety. During this week-long meeting, they reviewed the projects they have completed this year as well as planned for all the 2018 projects. It was great for them to meet in person, and everyone is more energized about the projects that will start in the upcoming year. Ecuador Volunteer Programs - 2016 started off with back-to-back volunteer trips to Ecuador. The Ohio Master Gardeners kicked it off, planting trees and school gardens and exploring native nurseries. Next came the Traveling School followed by two university groups--Northeastern and George Washington--who learned about local life while they contributed to community improvement and soaked up the stunning surroundings. All three groups worked with local schools on education and environmental projects. Women's Literacy Program - In Mali, the women's literacy program had another strong year. 304 women ranging in age from 14 to 55 attended classes for about 3 to 4 hours a day, five days a week. The supervisors, who have evaluated the program's progress, found that in each village the students are putting a lot of effort into learning and the instructors are dedicated to teaching. Grain & Cotton Banks in Sal-Dimi - At a general assembly meeting in Sal-Dimi (Mali), the community members heard a report by the committee that manages the bank and evaluated their work. The community members congratulated the committee for their good management, reelected the committee members for next year, and asked them to try and buy 2 tons of millet by the end of February. At that same meeting, the community members also evaluated the work of the committee that manages the cotton bank, which is run the same as the grain bank, and made plans for next year. “Dining for Women” Grant - Tandana is pleased to announce that it was awarded a grant by Dining for Women, a nonprofit organization that funds grassroots programs working in developing countries to fight gender inequality. The grant will help support Tandana's Literacy Program for women in Mali. Ologuine Well Project - The well has reached 21 meters in depth! They have not hit water yet, but the soil is moist and they expect to hit water soon. Literacy Program - To date, 1,117 women have completed the first phase of the Literacy Program. In this phase, the women have learned reading, writing and arithmetic. Kansongho Community Garden - The garden is thriving and the community members have even harvested fruit from the moringa trees! Indigo Bank - The new indigo bank, which Tandana supported, is officially open. Having the bank allows women in several villages in Ondogou Township to purchase all the supplies used in the indigo dyeing trade at an affordable and stable price. The women purchase the supplies they need on credit and once they have sold their product, they repay the bank. Training in safe indigo dyeing techniques was also provided for the women. Seven women were chosen to sit on the bank's management committee. The committee members attended a four-day training session to learn how to manage the bank and keep records. The committee members learned the skills needed to keep the records by participating in Tandana's Literacy Program. Quichinche - Master Gardener Volunteers purchased a tent for the Pastavi neighborhood in Quichinche so that community members would have a place to hold their community meetings and celebrations. Lakeside Service Program - Eleven students from Washington state assisted the school for students with special needs in La Joya where they painted furniture for a living classroom that will teach students home economics and lifestyle. The students also repainted the community center in Tangali. Throughout their trip the students participated in various cultural exchange activities such as homestays, salsa dancing, a visit to the Kichwa museum, and participation in a cooking class. REACH Service Program - Two different groups totaling thirty-two participants from Santa Barbara county in California joined Tandana for three weeks each. These groups are part of a four year scholarship and mentorship program who visited Ecuador as a culminating experience to end their program. One group stayed in the neighborhood of Pastavi, while the second stayed in the community of Agualongo. Both worked at the Quichinche school. There they installed a cement floor and put up the structure for the school’s new gazebo project, which will be used as a reading space and for lectures. They also spent a week working at Tandana’s summer school, where the REACH students worked in small groups to teach elective classes including dance, geography, food science, arts and crafts, and painting. Tech Service Corps Service Trip - The group of eighteen spent one week living and working at the Ulpiano Navarro School in the community of Quichinche. Work included installation of twenty desktop computers, one document camera, and the Rachel+ software system. They also installed 29 laptops and the Rachel+ system in Tangali as well as donated laptops to the Community Center, Milk Association, and the Water Coop. The participants had the opportunity to teach English classes that applied to the recently installed software system. Throughout their trip, the participants engaged in cultural activities such as the interactive Kichwa museum, salsa lessons, and a visit to the Afro-Ecuadorian community of El Juncal. 10th Anniversary - In celebration of the 10th anniversary of the Tandana Foundation, board members, staff, and friends of the foundation met in Ecuador for a week-long program in the end of September. The week was filled with presentations to help strengthen the work we do in areas such as scholarships, patient follow-up, expense reporting, storytelling, teambuilding, supporting our interns & fellows, community projects, and others. There was also time to do meaningful work in a few communities planting trees in Muenala, painting a community center in Cutambi, and cleaning out a drainage ditch along a road in Agualongo. Health Care Volunteer Venture - From October 9-16th, the Tandana Foundation held its twentieth Health Care Volunteer Venture. Fifteen volunteers arrived from various locations in the US to Ecuador, where they teamed up to provide free basic healthcare to five different rural communities in the Quichinche Parrish. The group included 4 certified medical providers, several professionals in the medical field, and volunteers without medical background. Volunteers, Tandana staff, two local dentists, and professionals from local public health clinics all worked together to intake patients, direct them to the providers, vision center, or dental care, and finally to prescribe and give any needed medications. Over the course of the week, over 500 patients from 5 different communities were seen. For patients who necessitate continuing care, the Patient Follow Up Program will walk with the patient through the public health system to access the care they need. Gardening Volunteer Venture - A small and dedicated group opened their hearts to Ecuador, planting 100 ornamental plants, 150 native trees and 25 medicinal plants during the last week of October. At the weather station in Inguincho, meteorologist Galo Perugachi shared observations about the impacts of climate change on Ecuador’s snowpack, species distribution, and growing seasons. Local friends joined the group on a field trip to the rumored to be 5,000-year-old Polylepis forest and to see the unique frailejon plants. Then, the group partnered with seventh graders from Quichinche school to beautify the school farm and share songs. They also planted Andean alders and other native trees along a streamside trail in Tangali, helping the community move toward its vision of a sustainable tourism venture. ARCC Programs - Two different group from ARCC's Latin America Gap Year program joined Tandana for a week each as a part of their travels and studies. The group is part of a three-month gap semester program which focuses on service learning and experiential education. The ARCC groups each stayed in the community center in Panecillo for a week while working at the Quichinche school. They contributed to creating the walls and ceiling for the school’s new gazebo project, which will be used as a reading space and for lectures. They also spent time learning about the traditions and practices of the region, and wrapping up their observations after their month in Ecuador. Student Mothers Project - The student mothers project supports girls from rural villages who are living in the town of Bandiagara, Mali, so they can attend middle and high school. They have to find families to host them, and, if they get pregnant, the families usually send them home and they have to drop out. This project provides training for the families to explain that they still host the students even if they are young mothers, and supplies food and basic medical supplies for the babies, so they are not an extra cost to the families. It helps girls stay in school despite the challenges of motherhood. School Garden in De - Kaleb Poudiougou, director of the middle school in De, Mali, wanted his students to learn about gardening and also realize that they could earn money for school supplies they need. Tandana helped make this dream a reality. The students and teachers now grow vegetables, such as tomatoes, squash, lettuce, peppers, eggplants, etc., and then the students sell the produce to earn money to buy school supplies. Tandana also provided tools, seeds, and training for the teachers, students, and parents association representatives. Bear Lake Health Care Volunteer Program –Three medical practitioners and twelve volunteers – all from the Bear Lake region of Idaho – joined Tandana and several local medical practitioners for a week of medical work in rural communities around Otavalo, Ecuador. In five days of clinics, the group provided care for 84 dental patients, 138 vision patients, 216 medical patients, and a total of 253 individuals. They also learned to cook a traditional Kichwa meal at Cocina Samyanuy visited the nearby town of Cotacachi, met with a local weaver and witnessed the traditional weaving process, explored Condor Park and watched a flight demonstration, and boated around the islands of the volcanic Cuicocha Lake. Ohio Master Gardeners Volunteer Venture – Fourteen dedicated master gardeners from Ohio joined Tandana for a week. 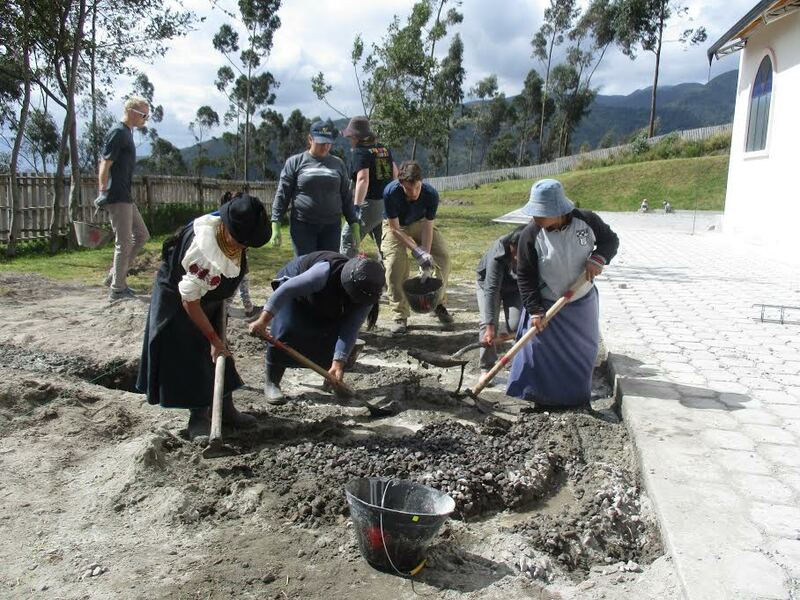 They spent time in several communities around Otavalo, Ecuador; at the vivero (tree nursery) in Achupallas, they weeded countless beds, covered over 100 feet of piping for the sewage system of the new building, and prepared bags of soil for future use. In Muenala, they planted around 500 trees and participated in an incredible minga feast with the community. In Guachingero, they planted and weeded a community garden, helped build a fence around a new garden area, and created activities for the grade school students using vegetables, leaves, and other natural (gardening) products. It was a lovely week of service, education, and joy. Northeastern University Group Service Project – Eleven students and one faculty member from Northeastern University in Boston spent a week building a bathroom at the community center in the community of La Banda. They worked alongside community members mixing cement, digging a trench for pipes, and laying cement bricks. They also had a lot of fun building relationships with the community members by not only participating in indigenous games but also by teaching them some of their own games, and enjoying community lunches with them. The community of La Banda enjoyed sharing this experience with a great group of students. George Washington University Group Service Project – A group of eighteen students and two faculty advisors from George Washington University in D. C. chose to spend their spring break week in and around Otavalo, Ecuador. Every morning, they worked in the community of Panecillo, learning from a local maestro the art (and science) of mixing concrete, plastering, and paving. In the process, they also built a stove that the community will use to cook large meals for mingas and celebrations, plastered the community kitchen, and paved a patio. While in Panecillo, they taught English classes to students in the local primary school. They also spent time with community members in Panecillo; they spent one afternoon with a Tandana intern's host family learning about traditional embroidery and bracelet making; another afternoon baking bread with a different intern's host family; and learning to cook a traditional Kichwa meal at a Panecillo-based cooking school. Additionally, they hiked around the volcanic Cuicocha Lake, explored the Condor Park and watched a flight demonstration of eagles and kestrel, and adventured along the shores of Mojanda Lakes. It was a week of laughter, service, and reflection. Health Care Volunteer Venture in Ecuador March 2015 – Over the course of two weeks, nine medical practitioners, one dentist, and thirteen volunteers from the U.S. and Canada joined Tandana and several Ecuadorian medical professionals to provide medical care in rural communities around Otavalo, Ecuador. In ten days of clinics, the group provided care for 218 vision patients, 406 medical patients, 706 pediatric patients, and 419 dental patients. They also learned to cook a traditional Kichwa meal at a local cooking school, visited a reed weaving cooperative, watched a master weaver practice his traditional craft, hiked to two lovely waterfalls, watched an instrument-maker create a pan-flute, played a game of soccer, hiked around Mojanda Lakes, participated in the Quichinche parade, explored the quaint village of Cotacachi, and boated around the sparkling San Pablo Lake. University of Cincinnati Education Program – In May 2015, 18 students and 4 chaperones from the University of Cincinnati joined Tandana to teach in four schools in different communities. The communities of Guachinguero, Cutambi, and Panecillo welcomed the students into their classrooms to teach English lessons, while the La Joya school offered the students a chance to work with 13 special needs children. The group enjoyed a wide variety of cultural activities including dancing in an Afro-Ecuadorian community, visiting a Kichwa culture museum, and learning about bilingual education after an exhilarating hike to Taxopamba waterfall. The trip was a wonderful way to end their semester after learning about Ecuador's culture and education system all semester long. In June 2015, a group of high school students and teachers from Ohio joined The Tandana Foundation in Otavalo for environmental service week. They helped local construction workers build raised germination beds inside the greenhouse at the UCINQUI native tree nursery and worked with Matias to care for the trees. They also visited a weather station to learn about climate change, hiked to the Peguche waterfall, and enjoyed a cooking class with Tandana's Patient Follow Up Coordinator Virginia Sanchez. It was an exceptionally rewarding experience for all. Debra, one of the teachers, remarked, "I have traveled with students on 8 different trips, in the US and abroad, and this was the best trip I have ever done. From the relationships we formed and the experiences we had, every aspect of this trip was wonderful. . . I know our students are better people for having been a part of Tandana!" Summer School – Three volunteers from the States and France took on 55 students for this year's summer school in July and August. Hosted by Ati Pillahuasu School in Panecillo, the students not only learned English but also a variety of other subjects. Each week had a different theme including movies, art, science, geography, and sports, and every Friday, the students did an activity together or went on a field trip. They made murals, played trivia games, and took trips to La Mitad del Mundo and The Living Kichwa Museum. The classes prepared the students to succeed in the new school year and offered new experiences. In June and July, another group of high school students and leaders from Lakeside School in Washington became new members of host families in Agualongo, Ecuador. During their month together, the families and students worked in the fields, baked bread, collected firewood, worked in mingas to improve the new community center, played games and did art projects, and enjoyed a boat ride on Cuicocha Lake. The Lakeside group also spent a week improving the facility of the La Joya school for children with special needs, brightening it up and making it more magical for the students. They hiked Fuya Fuya volcano and visited El Juncal, an Afro-Ecuadorian community. When it was time to part, everyone was sad that the end of their time together had come and grateful for the new friendships formed. In July, the community of Cutambi, Ecuador welcomed 15 students and 2 leaders from Adventures Cross-Country for a week. The students worked alongside community members constructing the first phase of the new casa communal. The students worked diligently and interacted with community members during their stay, making bracelets and playing exciting games of soccer. They enjoyed bathing in Peguche waterfall and learning about the vibrant Kichwa culture at the living museum. They were sent off with a wonderful despedida lunch of chicken soup and cuy and everyone was very excited and satisfied at the progress that was made. In October, Tandana’s Health Care Volunteer Venture visited five communities, namely Mojandita, Panecillo, Cutambi, Minas Chupa, and Guachingero. Four volunteer medical providers and nine non-medical support volunteers from the United States were joined by several local medical and dental providers, a few of Tandana's university scholarship students, interpreters, and other local team members. We provided medical and dental attention to 447 patients. This was our first medical program to incorporate EMR (electronic medical records). That first day in clinic was the test of our new technology and everyone wondered how it would work. After ironing out a few hiccups in the morning, as a team we got all our wires connected and ran a very successful day with our updated electronic records. There are many exciting advantages to the new electronic procedure, particularly in terms of the accessibility of patient histories for tracking patients’ medical concerns. Also, the new technology will allow Tandana even more accurate record keeping for patient totals, complaints, referrals, and other important documentation. And as usual, it wasn’t all work. Our group did several afternoon excursions to explore the Ecuadorian countryside and re-connect with many of Tandana Foundation’s old friends. We held our final luncheon at Tambo Inti in Quichinche and invited all of our team members; our amazing local dentists Doctors Pablo and Anita , our interpreters, our bus driver, and several of the Tandana Foundation Scholarship students who joined us in clinic were outstanding in their dedication and assistance. Also in October, Tandana Foundation hosted thirteen volunteers in various gardening projects in the Otavalo region north of Quito, Ecuador. We spent our first two work days in the school garden at Cutambi, planting bougainvillea, hibiscus, and begonias as well as building and painting planters out of old tires. The school children were thrilled to participate in these projects with their new North American friends. The clear skies gave us extraordinary views of Volcano Cayambe, the third highest volcano in Ecuador. Spectacular! The following day, we ventured north of Ibarra, the capitol of the Imbabura province, to visit the Afro-Ecuadorian community of El Juncal. There, we were treated to a tour at an organic fruit farm with our friend, Don Fabian, a delicious lunch at the cultural center, and a dance presentation by several girls from the community. Our next two work days were spent at the native plant nursery in Achupallas, supporting Don Matias in the important work he and UCINQUI are doing to revitalize native plants in this region. It is amazing to consider that in just four days we donated 288 hours worth of gardening work to local communities! In November of 2015, a group of gap semester students from Adventures Cross Country came to the community of Cutambi to help with the second step of building the casa communal. 14 participants joined us for 8 days in the community where they stayed at the local school and worked in the mornings with the community members. They also enjoyed spending time with the community children and participating in cultural activities such as bread making, bracelet making, and a community hike. On the last day of the community stay, community members in Cutambi and the ARCC participants together finished the roof of the building, achieving their goal. Stove making – From January 12 to January 19, 2015, The Olouguelemo Environmental Association – in partnership with The Tandana Foundation – held a training session on making more environmentally-friendly iron stoves. These stoves are much more efficient than cooking on open fires, requiring much less firewood. Twenty-two participants, representing the ten villages that make up Olouguelemo, attended the training session. The participants learned how to make two types of stoves, then returned to their villages to continue production. Cotton Bank in Sal-Dimi – The village and contractor have constructed a storehouse for the cotton bank, and the assembly of women chose a committee to manage the bank. Tandana provided training to the committee. The first stock of cotton has arrived, and the committee has divided it among the women in the village who want to work with it. Once they have sold the cloth made from the cotton, they will pay for the cotton they used, providing the fund for restocking the bank next year. Having the cotton bank will allow the women of Sal-Dimi to have access to cotton year-round at an affordable price. Cotton Bank in Yarou Plateau – As of April 2015, the cotton bank is operating, using a previously-built storehouse. The assembly of women has chosen a committee to manage the bank. Tandana provided training and the first stock of cotton to the committee. The women of Yarou Plateau are dancing with joy in the confidence that they will always be able to afford cotton to transform into cloth. Literacy Program – Our 2014-2015 session ended with a closing ceremony in each of the different villages where literacy classes were held. Students said that thanks to the classes they could count from 1 to 10,000, perform basic calculations (addition, subtraction, multiplication, and division), and read words. They also said they now could identify the numbers on a telephone and sizes on shoes. In two villages, the students performed songs and skits expressing the importance of what they had learned and its impact on their daily lives. Second Stove-Making Session-- Tandana, in partnership with the Ologuelemo Association, held a second stove making training session for the representatives from the four new villages who recently joined Ologuelemo. Just like the first training, this training was a huge success. The two representatives from Kansongho, who were at the first training session, also participated in this session as a refresher course. Savings for Change-- Tandana held a training session for the trainer and supervisor who will be involved in the new Savings for Change Program in Ondogou Commune. Aldiouma Tembiné, a local teacher, will be the trainer, forming groups of women and teaching them how to run the savings and credit program. Housseyni Pamateck, Tandana's Local Supevisor, supervises and supports Aldiouma. As of July 2015, there were 5 savings groups operating, with a total of 125 women. Each group had saved at least 35,000 CFA ($70) so far and loaned out the majority of that to members. In January 2014 the community of Gualapuro, Ecuador welcomed Miami Valley School from Dayton, Ohio into their homes for a two week immersion program. The group stayed with host families, sharing food, learning Kichwa, and lending a hand with some construction on the community’s school. Miami Valley School completed the first upstairs classroom by installing floor tiles, finishing the ceiling, and laying blocks on the cement staircase. The community of Gualapuro believes education to be extremely important and they have set a goal to provide each individual grade level its own classroom. They are grateful to the Miami Valley School students as they helped the community get one step closer to achieving its goal. Additional highlights from the program include: taking a trip to Lake Cuicocha with the students of Miami Valley and their host families, dressing up in traditional Otavaleno clothes for a soccer match, and teaching the community how to make pizzas and smores! After spending two memorable weeks in Gualapuro, the Miami Valley students returned home full of life changing memories that they will carry with them forever. The classroom is now complete and ready for use. The students have a beautiful mural painted on the staircase to remember Miami Valley School’s contribution to the community. In February 2014, a group of 16 enthusiastic Ohio Master Gardeners came to Ecuador interested in learning about local agricultural methods and techniques. They worked several days at the tree nursery in Achupallas with the Foundation’s good friend, Matias. Many hands made light work of filling bags up with dirt to be used for little seedlings, and for weeding the acclimatization beds. The participants also participated in two mingas, one planting trees in Muenala, and the other planting potatoes in Padre Chupa. As a part of this experience, the Gardeners enjoyed almuerzos comunitarios (community lunches) – a custom typical of indigenous communities where people bring dishes to share that are dumped onto a blanket and mixed together to be enjoyed by all. The Gardeners also did an amazing job facilitating educational art projects for students at Padre Chupa and Achupallas. In the afternoons, the Gardeners participated in various activities such as meeting a traditional weaver and healer, learning how to cook traditional Ecuadorian food, and touring a rose plantation. Thanks to the Master Gardeners for all their hard work! On Valentine’s Day 2014, Agualongo de Quichinche welcomed 18 Traveling School students and their 5 teachers into the community for a week! The Traveling School stayed with host families, learning how to peel potatoes with knives, eating around the tulpa (hearth), practicing their Spanish (and some Kichwa), and teaching their families how to make s’mores. TTS also had the amazing opportunity to participate in a minga with the community, during which they helped lay tiles in a new community center, dug trenches in preparation for the installation of soccer stadium lights, and gutted chickens to becooked for lunch. The community prepared a generous lunch for them, and all the girls had the opportunity to try cuy (guinea pig, a traditional Ecuadorian dish made for special occasions)! School looked a little different this week: learning about birds through an outing with their host families at the Condor Park; learning math from a local shopkeeper; taking a traditional cooking class; and learning about meteorology at a weather station in the middle of the clouds. Both Tandana and Agualongo are very grateful that TTS was able to spend some time with them during their three-and-a-half month South American travel adventure! Also in February, The Tandana Foundation welcomed 16 students and 4 chaperones from Parrott Academy to Panecillo for a week of a great variety of service projects and learning in the area. The first project they participated in was a painting minga in Agualongo, a community that is quite intent on improving their infrastructure and casa comunal. The PA students greatly helped with several projects at the UCINQUI tree nursery, by deconstructing the old greenhouse and helping put together the frame and dig holes for the new structure. They also taught English and craft lessons to the students in Panecillo and Perugachi, much to the enjoyment of those kids. The group also learned how to cook a traditional meal, visited a master weaver, visited Lake Cuicocha, played a great soccer game against the community of Agualongo and hiked to 14,000 feet on Fuya Fuya. Both the Tandana Foundation and the communities that the PA students visited are grateful for their enthusiasm and hard work! In March 2014, two groups from Northeastern University joined Tandana in Ecuador. One group stayed in the remote mountain community of Minas Chupa and worked with community members to build a fence to keep livestock out of the school yard. Together they installed a gate, put in posts, pulled barbed wire, and built friendships. While in Minas Chupa, the group also baked bread with a local family, taught computer lessons to local students, and danced to live Inti Raymi music with a chicken. Meanwhile, the other group, composed of twelve Northeastern Honors students and faculty, joined the community of Gualapuro to help build a school and join the fun of Carnaval. Alongside community members, the NE students mixed cement and laid bricks like pros, building the brick walls for two new classrooms in the community. In their rest time, the NE students led English lessons for the community’s students, made traditional meals, explored culture sights and blasted each other with foam and water during the community’s Carnaval celebrations. Also in March, a group of Alternative Spring Break students from George Washington University came to participate in a service trip in Ecuador. They worked in the beautiful community of Guachinguero moving sand, rocks, and tying wire to help with the beginning stages of building a second story of a school building. The University students also prepared and taught thoughtful and creative English lessons for the school kids. When they weren’t working, they enjoyed hiking around Guachinguero, baking bread and making bracelets with the women of the community, taking a traditional cooking class, playing with kids, and soaking in the healing waters of some local thermal springs. Thanks to GW for bringing their willingness and ánimo to everything they did! Next, Tandana welcomed a group of students from the University of Cincinnati to Ecuador. The students worked in a different community each day –Perugachi, Quichinche, Panecillo, Guachinguero, and La Joya – teaching English and playing games with the students. At La Joya, a school for children with special needs, the UC students helped paint a mural and even fed the kids breakfast and lunch. In the afternoons, the students learned more about Ecuadorian culture through a traditional cooking class, a musical instrument demonstration, a talk about bilingual education by Tandana’s good friend Segundo, and an outing with Tandana University scholarship students to the Condor Park and Lechero tree. What a full week! To wrap up March of 2014, Tandana had two weeks of health care during which we visited ten communities and attended to 661 children and adults. We traveled to several far away communities including Minas Chupa and Muenala, offering care to patients who have difficulty accessing medical services. Staff from the Gualsaqui subcentro traveled with us on many days and even volunteered to work with us on Saturday. Patients were treated for hypertension, h. pylori, parasites, and many other medical conditions, in addition to receiving extractions and fillings from our dental team. When not hard at work, the volunteers enjoyed a boat ride on Lago San Pablo, swimming in the volcanic springs at Tangali, learning about traditional healing from shaman Santos Quilumbango, and visiting master weaver Miguel Andrango. In April 2014, The Tandana Foundation and the community of Guachinguero welcomed 20 participants from Raymond High School in Alberta, Canada. The community is working on building a second floor on one of their school buildings, which will serve as a computer lab and teacher prep room. The group worked on the second phase of this project and stayed in the community center. Thanks to the many additional hands, the entire concrete floor on the second story was completed and the walls were removed from the first floor. The Raymond students also enjoyed the chance to teach in the classroom, as they had already spent lots of time getting to know the local kids. They also learned how to make bracelets and bread, hiked to the mineral springs in Tangali, and learned to cook a traditional meal. Their enthusiasm and teamwork while moving thousands of pounds of cement were impressive, and the community is excited to have shared the experience with Raymond School and to be one step closer to completing this important project. During the summer, Lakeside School of Seattle, Washington worked with The Tandana Foundation as part of their Global Service Learning Program. Through this program and partnership, ten students and their chaperones completed three different service projects over the course of 30 days. Specifically, they helped construct part of a local school, worked in a native tree nursery, and painted a house complete with a beautiful mural. They also organized a day camp for the children of their host community, teaching English, art, and field games. This cross-cultural learning experience was made even more special by the bond formed with their host families of Gualapuro, who welcomed them with such open hearts. Alongside their new families, students enjoyed making smores at a community bonfire, practicing their Kichwa, and dressing up in traditional clothing for the annual Inty Raymi festival! The month was full of unforgettable moments for the Lakeside students, introducing them to a new culture and new friendships. In October, Tandana spent a week with 13 incredible volunteer gardeners from across the United States. In the mountains around Otavalo, Ecuador, they worked with Matias to plant granadilla seeds, cut alder shoots, reinforce the greenhouse at the Vivero, and plant 500 acacia trees with the community of Muenala. They also created activities for the grade school at Guachingero, including an interactive lesson about compost and another on starting seeds in a hollowed out orange peel. It was a wonderful week of service, adventure, and laughter. Next, five medical practitioners, one dentist, and eight volunteers joined Tandana for a week of medical work in rural communities around Otavalo, Ecuador. In five days of clinics, the group provided care for 102 vision patients, 213 medical patients, 274 pediatric patients, and 337 dental patients. They also learned to cook a tradition Kichwa meal at a local cooking school, visited an instrument maker and watched a pipe be assembled in less than five minutes, met with a traditional shaman, and boated around the islands of the volcanic Cuicocha Lake. The week was lovely – full of service, care, and exploration. In early November, Tandana was joined by a Gap year group of students from Adventures Cross Country. They spent one week in the community of Guachinguero working on the fourth phase of construction of a new building for the local school. The group started off priming and plastering the building, and later painted it three different vibrant colors. They also had the opportunity to teach English at the school. The group participated in a number of local excursions and activities including: bread and bracelet making, cooking, attending a local wedding, dressing in traditional attire, visiting Cuicocha Lake and of course spending time shopping in the famous Otavalo market. The community sent them off with an amazing despedida filled with speeches, songs, dances and a grand feast of guinea pig, chicken soup, corn, cheese, favas and juice. In December, three students and two leaders from Breakwater Expeditions participated in a volunteer program in Panecillo, Ecuador. They started off their trip by joining in a community minga, helping build a kitchen and bathroom next to the school. They then stayed in the community center and taught songs in English at the school each day they were there. On the final day, the kids put on a despedida and sang the songs they had learned. The participants also sang for the kids, and then everyone had a wonderful lunch together. The participants enjoyed the waterfall at Peguche and the always-delicious food at Cocina Samyanuy cooking school. They also enjoyed time with community members, working in Dionisia’s garden and making fajas with Rosa. Community Garden in Kansongho – Tandana supported community members in Kansongho with a fence, water tower, solar pump, and irrigation system for a community garden. In the fall of 2014, community members harvested their first crops from their garden. They learned how to grow new vegetables, which they had never gone before. They also learned how to prevent termite attacks, germinate seeds, and make garden beds. Along with all the training they received on gardening, they also receive training on the garden's new irrigation system. They learned how to care for, maintain, and fix the irrigation system. The community members enjoyed the training and are now enjoying putting their new knowledge into practice. Literacy Program – This important Tandana program keeps growing. In December 2014, a 30 day training for new literacy instructors was held. At the end of the training. The seven most qualified candidates were chosen to join Tandana's three experienced instructors. Out of the seven new instructors, three are women, which is very exciting. Most impressive is Ada Kanambaye, who was one of our literacy students a couple years ago and is now working to teach her fellow women how to read and write. Each of the ten instructors are now teaching five days a week in different villages. The different villages are Orsongho, Dianou, Oyè, Goundoli-Dogon, Ologuiné, Sol-Dogon, Sandian, Tené, Gagnaga, and Kani. All the classes are going well, and in March the updated version of the teacher's guide was finalized and distributed to the instructors. Cotton Bank in Sal-Dimi – The construction of the storehouse for the cotton bank is going well. The committee who will manage the cotton bank have been selected and trained. The first stock of cotton has arrived and has been divided among the women in the village who want to work with it. Once they have sold the cloth made from the cotton, they will pay for the cotton they used, providing the fund for restocking the bank next year. Having the cotton bank will allow the village's women to have access to cotton year-round at an affordable price. The women are excited to have control over the cotton, which is a vital resource for them. This project is truly improving the lives of women in Sal-Dimi. Savings for Change -- Savings for Change group members in Yarou Plateau meet weekly to save and receive loans. Each week, every member contributes a set sum to the fund, and they use the fund to make loans to members for expanding their businesses, which include micro-commerce, gardening, and cotton work. The loan repayment rate is 100%. Ologuelemo -- Tandana provided support for the environmental protection association Ologuelemo, involving 8 villages, and training in the fabrication of efficient cookstoves. Carpentry -- Tandana provided additional carpentry training for men in Kansongho. In February 2013, nineteen Master Gardeners from Ohio came for the first time to work with Tandana in Ecuador. They worked alongside Matias Perugachi in the UCINQUI tree nursery in Achupallas. Matias, our good friend and sole employee of the nursery, was blown away by their enthusiasm and how much they accomplished. In addition to improving the tree nursery, which benefits twenty-three communities, the group was also able to participate in many other cultural exchange activities, including a traditional cooking class and seeing an international chainsaw sculpture symposium in action. A highlight of the trip included planting 200 trees with 46 students at the Quinchinche school and teaching some fun lessons on the importance of plants. At the beginning of March, a group of 12 students from Northeastern University joined Tandana to work and learn together in the community of Gualapuro. Every morning the students worked on building two playground structures for the preschool in Gualapuro and caring for the preschoolers. One structure was designed kids ages 4 and up, and one for toddlers. By the end of the week, they completed the play structures and were able to see the children enjoying their new toys. In the afternoon, the students spent more time in the community harvesting local crops, weaving bracelets and making bread by hand. The week culminated in a celebration featuring dance and song performances by both local children and the Northeastern students. Next, nineteen staff and family from Bear Lake Memorial Hospital in Idaho flew to Otavalo to work with Tandana putting on free medical clinics. Bringing a strong sense of enthusiasm and organization, the group went straight to work, running six medical clinics in five days! The team saw 190 medical patients and performed 228 pediatric check ups. They also added to our diagnostic abilities by bringing a portable ultrasound machine. In their free time they explored Peguche Waterfall, saw a weaving demonstration from master weaver Miguel Anrango and cooked a traditional dinner with indigenous chef Claudia Fuerez. They also danced and one group member rode as queen on the Tandana float in the parade opening the Quichinche festival. Then came our thirteenth Health Care Volunteer Venture. For two weeks, volunteers including six doctors, a dentist, and others from throughout the United States and Mexico worked together to provide health care in ten rural communities in Quichinche parish. They improved our dental capabilities with more equipment and materials for preventative treatments such as fluoride and sealants, and they performed check ups on 591 children in addition to seeing 443 medical patients. After work, they enjoyed seeing Ecuador beat Paraguay in a World Cup qualifying soccer match, hiking from the condor park to the Peguche waterfall, visiting Cuicocha and Mojanda Lakes, and dancing to live Andean music. In the last week of April, the 8th grade class from Headwaters Academy in Bozeman, Montana joined us in the rural community of Padre Chupa for a week-long camping trip. The group of ten students and two teachers packed their sleeping bags and stayed at the elementary school located at over 10,000 feet elevation in the Andes Mountains. There the group helped the community to harvest over 400 pounds of potatoes and plant an assortment of vegetables for the upcoming harvest season. The students of Headwaters also taught an array of activities from Capture the Flag to “Twinkle, Twinkle, Little Star.” Likewise, the children of Padre Chupa shared their culture in the form of dance, food, and traditional music. They wrapped up the week with a day trip to the Interactive Science Museum in Quito where all of the kids learned about the human brain and laws of physics before saying their sad goodbyes. During the summer, twelve students and three chaperones from Lakeside school in Seattle, Washington spent a month living in the community of Agualongo and completing service projects. Each student was paired up with a host family, allowing them to immerse themselves in the local indigenous culture and practice their Spanish. For the first two weeks they spent their mornings volunteering at the native tree nursery of UCINQUI, building a water reservoir and lending a hand to the sole caretaker Matias Perugachi. During the last two weeks of their stay they helped the Tandana Foundation run its summer school for local students. They assisted in English classes and taught their own classes on music, physics, and biology. They also had the opportunity to have fun with their host families while painting a community center, taking a boat ride on Lake Cuicocha, and teaching them how to make smores over a bonfire! In October 2013 a small group of medical professionals and volunteers came together in Quichinche to provide quality medical care at no cost to 5 different communities. The numbers say it all: 167 medical patients, 70 dental patients, 176 pediatric check-ups, all done in 5 short days. Not only did the group work hard but they also enjoyed the sights, including the majestic Cuicocha crater lake and watched the Ecuadorian national soccer team nearly qualify for the 2014 World Cup in Brasil. Later in the month, 6 wonderful gardeners assisted Matias in the tree nursery in Achupallas where they filled 564 bags with dirt and later transplanted 408 seedlings that they collected from the roadsides. They also participated in a tree planting community work day in the community of Muenala where, alongside members of the community, they planted 600 alder and Pumamaki trees. They also helped a 7th grade class plant a school garden and then taught them lessons about composting and insects. In the afternoons they enjoyed the Saturday market in Otavalo, the Peguche waterfall and many other local sights. Great Job everyone! Agricultural Innovations -- Short-cycle cowpeas, which Tandana introduced to ten villages, were the only ones that bore edible peas in some villages this year, because the rainy season was so short. These peas provide food during the most difficult time of year, when other crops have not matured and the previous harvest is long gone. Well in Sal-Sombogou-- Community members and masons put the finishing touches on the restored and improved well in Sal-Sombogou, Mali. Before restoration, the well was dangerous and pollutants easily fell into the water. Literacy-- Tandana provided literacy classes in 10 villages this year. These classes empower women with literacy, numeracy, and calculation skills. With the abilities they gain in these classes, students say they can manage independently in the marketplace, buy and sell without fear, get the products they want, and even keep better track of their menstrual cycles for spacing their pregnancies. Ologuelemo-- Tandana provided training in assisting the natural regeneration of trees and soil conservation for members of the environmental protection association Ologuelemo, involving 8 villages. During a meeting of the association, a governement forestry agent addressed the group, the first appearance of a public official of that level in the area. The villages are working together to protect trees in their region. Carpentry-- Tandana provided carpentry training for men in Kansongho. They now have a carpentry workshop where they can build doors, windows, furniture, chalk boards, and other wood products. This local business empowers them with a source of income close to home. Savings for Change-- Tandana provided training to women’s savings and credit groups in Yarou Plateau. They meet weekly to save money and then make loans from their group fund to members to expand their micro-businesses. In Ecuador, we had a busy spring with five different volunteer groups. In February, twenty students and six chaperones from Parrott Academy in North Carolina spent a week with us, rotating through several communities outside of Otavalo. They participated in a minga (community work party) that prepared the materials to build a retaining wall to protect Panecillo's water source from erosion and pollution. They also volunteered at two local primary schools, in Panecillo and Padre Chupa, where they taught English as well as arts and crafts. The group also helped at a plant nursery owned by the Union of Indigenous Communities of Quichinche. After visiting the Peguche waterfall and a master weaver, the group capped off its trip with a tour of Quito. Some of the student are already planning ways they can return! Also in February, fourteen students and four teachers from The Traveling School also joined us for their sixth stay in the rural community of Agualongo. In seven short days the students and teachers cultivated deep and meaningful relationships with the members of the community. During their stay, the students took classes and also participted in a traditional Ecuadorian cooking class, bread making, a hike above the valley with a local woman, a lesson on rural farm practices, and of course many hours of soccer with local children and dancing to traditional ecuadorean music. The students helped with a two day minga to replace the roof of the community center, followed by a feast complete with guinea pig, corn, soup, and potatoes. When it was time for their departure, tears were shed by students and families alike. The community insisted that next time, they must stay longer! In March, came a group form Northeastern University, traveling as part of their Alternative Spring Break program. This group worked with community members from Panecillo to complete the construction of a retaining wall designed to prevent erosion that pollutes and blocks one of the community's two water sources. The students also collected saplings and planted a local tree species that provides extra protection against erosion. In addition to their community service, the group enjoyed cultural activities and outings, including a cooking class, a visit to a local weaving master, and a trip to Mojanda Lakes. Meanwhile, 11 students and 2 leaders from Carpe Diem International Education came to stay for 10 days in the community of Achupallas. For seven days the students worked on constructing a greenhouse for the UCINQUI native tree nursery. Their hands and hard work were deeply appreciated by Matias, who runs the nursery, and the other members of UCINQUI. Carpe Diem students also taught English classes to the elementary students of the community and managed to fit in bread making, cooking class, arts and crafts with community children, a visit to the Peguche waterfall, a beautiful hike around Laguna Cuicocha with community members, and a wonderful fiesta with live music and traditional food! The experience was a first for both the community, which had never hosted a foreign group before, and the students, who had never stayed in a rural community such as Achupallas. Many of the students found a deeper appreciation for living more simply with a greater focus on family. The community is anxious to host another group. Finally, thirteen volunteers traveled to the Quichinche parish of Ecuador for our eleventh Health Care Volunteer Venture. Together, the group accomplished an amazing amount, setting up basic health clinics in five villages in five days. The doctors were able to see 134 patients, while 49 adults received dental treatment. 223 children received preventative dental treatment including fluoride and sealants to prevent cavities, as well as parasite medication. In between administering quality health care, the volunteers cooked a traditional Ecuadorian meal, hiked to the Peguche waterfall, watched a traditional weaver practice his art, and had a picnic at Mojanda Lakes. Tandana health care teams have seen over 3600 medical patients and 780 dental patients! In late September of 2012, twelve students from Carpe Diem Education and their two Leaders joined six Tandana representatives in the community of Achupallas, Ecuador. The participants spent ten days living with local families and making friends with their hosts. In the mornings, they volunteered in the UCINQUI Tree Nursery, helping to construct a house and take care of the plants. In the afternoons the participants cooked a traditional Ecuadorian meal, toured the Condor Park, hiked to Cuicocha Lake, learned Kichwa phrases and made bread with a local family. The participants also joined in with community members to repaint the elementary school and created beautiful murals for the children to enjoy. In October, we hosted our twelfth Health Care Volunteer Venture in Quichinche, Ecuador. Twenty volunteers, including three doctors, three P.A.s, three nurses, and other helping hands worked together, along with a local dentist and interpreters, to provide primary health care in ten different villages. Through medical consultations, dental treatments, and pediatric check-ups, they served 902 patients in two weeks. In addition to bringing their care and skills to rural villages, they also enjoyed Ecuador's food, music, crafts, and sporting events. A highlight was watching Ecuador beat Chile in a World Cup qualifying soccer match. In January 2012, eleven volunteers spent 16 days in Mali, helping with a variety of community projects. They helped build a grain bank for the village of Sal-Dimi and a latrine for the Kansongho cotton bank, as well as watering trees in the Kansongho orchard and participating in a soap-making training and a literacy class. They also found time to do lots of Dogon dancing, learn to speak some Tommo So, try drumming the traditional rhythms, visit a school and a mosque, participate in a wedding ceremony, and show villagers how to use new tools. The community members in Sal-Dimi are thrilled to have a stock of grain in this very difficult year and a safe place to store it and escorted the volunteers out of the village with song and drumming to alleviate the sadness of the farewell. Our fourth Mali Volunteer Vacation was a meaningful experience for all: "we formed friendships and became fully immersed in the culture of Mali's Dogon region while providing aid for truly sustainable projects; And most importantly we worked right alongside WITH the community in the finishing of such projects, truly a collective effort allowing us to weave lasting friendships. The appreciation and welcome we received from these communities was like none other I've ever experienced!" said volunteer Kelly McCosh. Meanwhile, we have begun a literacy class for the women of Kansongho and Kani, Mali. Using the first books printed in Tommo So, 150 women in 6 classes enthusiastically practice writing letters and numbers with the help of a local teacher. Thanks to a soap-making training, Kansongho women are also diversifying their sources of income. In Sal-Dimi, we have begun restoration and stabilization of the traditional well, which was in danger of collapse and needed constant repairs. We've also been assisting both villages with agricultural innovations such as the natural regeneration of trees in the fields and short-cycle cowpeas. Later in 2012, our projects continue to move forward despite the unsettling national news. The community members of Kansongho and Sal-Dimi are extremely grateful for our gift of millet, which allowed them to cultivate their fields and bring in a bountiful harvest this year. Our second season of literacy classes is beginning, and we are expanding the Savings for Change micro-credit program to Yarou Plateau, in addition to more villages in Wadouba Commune. The environmental association Ologuelemo, which we supported in becoming a legal organization, is busy working for the encouragement of natural regeneration of trees in an eight-village area. We have also completed restoration of the traditional well in Sal-Dimi, and villagers are confidently using it. In Yarou Plateau, we've helped the school and village with some seeds and training for their garden. And community members in Kansongho, Sal-Dimi, and 6 neighboring villages have held an assembly, with our support, and determined to create an association for protection of the environment, most specifically the encouragement of natural regeneration of trees and the prevention of wood cutting in a large area. In partnership with Vital Edge Aid, we are helping to expand the savings and micro-credit program that has begun in 8 villages of Wadouba commune. The literacy classes continue. The community members we work with are as determined as ever to keep working for the improvement of their communities. We hope that the political situation will allow them to do so. During the first week of March 2011, a group of 12 students from Boston’s Northeastern University spent their spring break working on various community service projects in the rural communities surrounding Otavalo, Ecuador. Students were greeted by the community of La Banda with a welcome ceremony featuring traditional music and a communal lunch. During the week, they dug and hauled dirt and mixed cement to build a new bus stop. The covered bus stop will provide much-needed protection from heavy rain and intense sun for residents of La Banda, who ride the bus for their daily commute to Otavalo. Other community projects included organizing and inventorying books for a new library in the local elementary school and working in a native tree nursery. In their free time, the students enjoyed a cooking class and delicious dinner with a local family. They prepared and ate guinea pig, chicken, marinated tomato and onion salad, llapingachos (spiced and fried mashed potato pancakes), mote (steamed fresh corn), and quimbolitos (banana leaf wrapped pastries). They also challenged the local kids to a soccer game, visited both traditional and modern weavers, learned about traditional musical instruments, hiked around Cuicocha Lake, went to the Peguche Waterfall, and celebrated Carnaval with a water balloon fight. Our local friends were grateful to the students for their willingness to work hard and leave a lasting legacy in their community. Carpe Diem International Education joined Tandana for 2 weeks in March, doing homestays in the community of Agualongo and helping with projects from trash cleanup with local kids to weeding and transplanting native tree seedlings to teaching English and computer classes, preparing books for a new school library, and even Tandana's health care work in rural communities. During their time with Tandana, the students and their leaders not only experienced the Ecuadorian minga but also cooked and ate traditional foods, played soccer, joined in water fights for Carnaval, and danced in the parade opening the Quichinche festivals alongside the students they had been teaching during the week. Tandana's ninth Health Care Volunteer Venture, in March 2011, was a great success. We worked in a different community every day, including two nearby and three more remote communities. Volunteers worked to take patients’ histories and vitals, interpreted for the doctors, dispensed medication in the pharmacy, and were runners between each station. The doctors saw a total of 133 patients in 5 community centers, and the local dentist saw 74 patients. Afternoon activities for the volunteers included going to the Peguche waterfall, having a cooking class (followed by a delicious dinner), visiting the Condor Park, shopping at the famous Otavalo market, and visiting Cotacachi, a town known for its leather goods. They also participated in Tandana's first ever float and dance troupe in the parade opening the Quichinche festivals! In early May, ten students and two teachers from Headwaters Academy in Bozeman, Montana spent a week in the community of Padre Chupa. They were welcomed by the students and the entire community with a procession to the school, bringing firewood to make a huge bonfire, where everyone ate hot dogs and s’mores. They worked in the school garden alongside the 24 Padre Chupa students, and the community came together to install new soccer goals and volleyball posts in the soccer field. Needless to say, much soccer was played throughout the week! The Headwaters students also planned and taught lessons and activities to the Padre Chupa kids (including line dancing and Red Rover), and took a hike down into the valley to a waterfall. They took the Padre Chupa students to the thermal springs at Chachimbiro, an excursion that was enjoyed by all. They also made time during their brief stay in Otavalo to stop by the market, visit some local friends, and see a traditional weaving demonstration. The kids were sad to say goodbye to their new friends in Padre Chupa, but proud of all they had accomplished! Five intrepid volunteers spent five weeks volunteering in Ecuador through our Summer Volunteer Program. Four worked with the Tandana intern to teach a month-long summer vacation English course, and one worked with local nurses and doctors in a rural health center. Volunteers stayed with host families around the communities of Panecillo and Quichinche and played countless games with all the neighborhood kids. They experienced traditional music and dancing during the fiestas of Inti Raymi in June, went to the thermal springs at Nangulvi, helped plant seedlings at a native tree nursery, rafted in the Chota Valley, hiked around Mojanda and Cuicocha Lakes and even 15,000 foot Imbabura Volcano. They also had two cooking classes with Tandana friend Claudia, and ate their way through every flavor of pie at the Pie Shop in Otavalo. They took two longer excursions, one to Atacames, a beach town on the coast, and a final trip to a jungle river lodge in the Amazonian eastern part of Ecuador. Relationships they formed their host families by sharing daily life, meals, work, and play were a highlight of the experience. In October 2011, nine health care volunteers joined four long-term volunteers, our intern, our Group Coordinator, and Tandana's director for our tenth Health Care Volunteer Vacation in Ecuador. With great camaraderie, commitment, and an everpresent sense of fun, they visited five communities to offer basic medical consultations. The providers treated 168 patients, while the dentist saw 85. Meanwhile, our team of nurses did an additional 251 pediatric check-ups and treated all of those children for parasites. The team also found time to take in the scenery at Mojanda Lakes, cook quimbolitos and other goodies with Claudia, visit a shaman and a master weaver, and celebrate two birthdays. Over the last five years, Tandana health care teams have seen over 3500 medical patients and 650 dental patients! Also, in October, eight students and two leaders from Carpe Diem International Education joined us for a week in the community of Agualongo, Ecuador. They constructed acclimatization beds for tree seedlings at the UCINQUI native tree nursery and helped the community of Agualongo install a sink and countertop in the community center. Meanwhile, they also learned to bake bread with Agualongo women, went on a hike above the village with a host mother, played soccer with local kids, and learned about the family trees, food preparation practices, and culture of their host families. After the minga on Saturday, they sang a song in Kichwa at the farewell ceremony, ate soup, fava beans, potatoes, corn, colada morada, and tortillas de tiesto prepared by the community, and danced to the music of a local band. They left a mark on the community and carry many happy memories as they continue their journey through the Andes. In January, we hosted our third Mali Volunteer Vacation. After making mudcloths in Djenne, the group traveled to the village of Yarou Plateau, where they were welcomed with performances by horsemen, hunters, and women. Volunteers and students planted mango trees in the new school garden and visited the storehouse for the the school lunch program, both projects made possible by Tandana. In Kori-Maounde, the volunteers also helped students plant fruit trees and visited the caves where village ancestors hid from enemies before and during the French occupation. The highlight of the trip was the week spent in the village of Kansongho, reconnecting with old friends and making new ones. Community members and volunteers danced in celebration of the group's arrival, then got to work building a storehouse for the new cotton bank, which will allow the women of the village to manage a large stock of cotton so that it is always available on credit and at a good price for them to transform and generate income. The children of the village did a mask dance and the young adults did a skit about cotton and a bendie dance performance, showcasing aspects of their culture that are in danger of being lost. Finally, the volunteers visited Sal-Dimi, where Tandana is restoring a well, then spent two days relaxing on the Niger River and reflecting on the amazing projects, celebration, and sharing they had participated in. In February and March, Tandana coordinated 2 service projects, hosted a benefit trip, and put on 2 health care volunteer ventures in Ecuador. The first project was for The Traveling School, who did their fifth village stay and service project in Agualongo. The girls and their teachers attended a traditional wedding ceremony on their first day in the community, then taught English classes for local children and helped to replace the roof on the community center. They went on a hike in the surrounding mountains and baked bread with local women, visited Tandana's scholarship coordinator for a math lesson, and went to a community-owned native tree nursery for science class. A highlight for many was helping to prepare guinea pig for the celebration feast on their last day in the village, and their memories of the week in Agualongo remain strong as they continue their journey through the Andes. Next, a group of enthusiastic, energetic women from Northeastern University arrived to work with the community of La Banda. A ceremony featuring a communal lunch, traditional dances, demonstrations of traditional dress, and "ollas encantadas" a local version of piñatas, welcomed them to the community. During the week, they hauled sand and gravel up a steep hill, dug a trench, carried bricks, and helped community members build a water filtration tank to provide clean drinking water for the village. They also helped at the native tree nursery, visited both traditional and modern weavers, baked bread with community members, and visited Cuicocha Lake. The group's excitement about their experience has led them to recommend traveling with Tandana to their friends back in Boston. We also had our second benefit trip, hosted by Nik Millhouse and Hacienda Cusin. The group enjoyed a wonderful tour, featuring world-class Pakacuna gardens, Haciendas Cusin and Pinsaqui, colonial Quito, a meeting with Tandana scholarship students, and visits to several communities where Tandana works, a master weaver, and leather and woodcarving craft towns. They are excited about seeing Tandana's work and the beautiful Andean countryside, and their support of our efforts is tremendously appreciated. Finally, in March we had two wonderful groups of volunteers who helped provide health care to rural communities in our seventh round of Health Care Volunteer Ventures. Both groups became efficient teams, allowing local access to important health services and also enjoyed visiting local friends, cooking class and baking bread in local homes, seeing waterfalls and lakes, and singing our new Kichwa health care song. We now have our own dental equipment and were able to hire a local dentist to fill cavities and extract teeth on site with us while we work. She did a fantastic job, treating 15-20 patients during each morning of work. The groups saw 428 patients in 7 communities, treating everything from parasites and conjunctivitis to arthritis, hypertension, and pharyngitis. In April, the eighth grade class from Headwaters Academy in Montana spent a week living and working with the rural community of Padre Chupa. After a breathtaking ride to reach the community, they were put to work right away. They joined local parents in creating a school garden by preparing the soil, building a protective fence, and planting seeds. In the following days everyone stayed very active while participating in hikes led by the school children to a nearby waterfall, to visit a sugar cane press, and to a ridge with a beautiful view of the surrounding area. Together, the two groups of students also baked bread, built a campfire to make s'mores, and painted a sign for the school. The week concluded with a trip to the Chachimbiro hot springs where many of the students from Padre Chupa got the chance to go swimming for the first time in their lives. In June, The Tandana Foundation hosted 14 volunteers from North Carolina and Georgia in service projects in two communities just outside of Otavalo, Ecuador. The all-women group enthusiastically dove into all aspects of their Ecuadorian experience. From mornings in Larcacunga trimming baby trees in the local native plant nursery and shoveling rocks and cement at the community center in La Banda to afternoons visiting indigenous artisans and hiking to sacred waterfalls, they embraced every opportunity to get to know this new place and all of their new friends. One of the group’s favorite afternoon activities was spent at our friend Claudia’s house for a cooking lesson. The group learned how to make llapingachos (spiced and fried mashed potato pancakes), quimbolitos (banana leaf wrapped pastries), mote (steamed fresh corn), marinated tomato and onion salad, and a delicious spiced beef. That night, they feasted wonderful foods, but Claudia’s incredible warmth and hospitality was the greatest treat of all. All of the volunteers worked hard and our local friends were pleased with their efforts. On our final night in Quito, everyone brainstormed ideas for further service projects and all of the friends and family members they wish to bring along on the next Tandana adventure. Three volunteers spent six weeks in Ecuador through our Summer Volunteer Program. They started with a week in Otavalo where they began to learn about what life in the rural Ecuadorian highlands would be like through walks in the nearby communities, visits with local friends, and an introduction to shopping in the market. They further explored the area by attending an Inti Raymi (Incan Sun) festival in the leather town of Cotocachi and a hike around the rim of the volcanic lake Cuicocha. Next, the volunteers settled into life with their host families and began their volunteer placements at subcentros (rural health centers) or teaching summer classes for Tandana’s scholarship students. Although everyone was busy with their volunteer work and spending time with their host families, the group got together every Friday to take the summer class students on field trips to waterfalls, lakes, and swimming pools. They also met up for weekend adventures to go hiking and rafting. The program concluded with a trip to the coast to enjoy a few days of whale watching and wildlife viewing on Isla de la Plata. About 50 students benefited from the summer enrichment classes in their most difficult subjects, and two rural health centers received support in their work to take care of the patients in their areas. In October, we completed our 8th round of health care volunteer ventures. Since we began four years ago, we've been able to greatly improve our health care work with better systems, the appropriate supplies and information, and more connections in the local health care world. This month, our volunteer groups were able to see 262 patients for medical care and 205 patients for dental care, in addition to treating 159 schoolchildren for parasites. 526 people benefited from our visits to 10 rural communities in the Otavalo canton, and some of them received follow-up care with the help of our intern and two wonderful volunteers. In addition to an emergency room physician, two Physician Assistants, a registered nurse, and an occupational therapy assistant, we also had the help of a group of 11 students and 2 leaders from Carpe Diem International Education, a gap-year semester program. The students lived with host families in the rural community of Agualongo, and each week half of them helped with our medical work while the others took Spanish classes. They formed strong bonds with their host families, attended a traditional wedding ceremony, baked bread with Agualongo's president's family, and volunteered in a native tree nursery. The volunteers also learned about traditional healing from a shaman, visited a master weaver, and saw volcanoes Cotopaxi, Altisana, Cayambe, Cotacachi, and Imbabura while driving to remote mountain villages to provide health care. Our scholarship program is going strong with 45 secondary students and our first university scholarship student benefiting! Margarita Fuerez, who is our first university scholarship recipient is a bright and motivated young woman who has overcome many obstacles in her life. She is studying accounting and is already working on a project to create a youth council in her area to get young people involved in serving their community. In January 2010, Tandana's Mali Volunteer Vacation group enjoyed a meaningful and rewarding experience of village life and travel. After traveling from Bamako, and making mudcloths with artisans in Djenne, they visited the Kori-Maounde school garden, where students showed how they were taking advantage of Tandana's first project in Mali. Next, they hiked down the Bandiagara cliff to Tereli, where they helped students plant fruit trees in the school garden, also funded by Tandana, and were treated to a mask dance as a show of appreciation from the community. Then they went out to the village of Kansongho, where the whole group was blown away by the reception they received. Rifle shots, singing, dancing, Dogon masks, speeches, gifts, and skits celebrated their arrival. They visited the grain bank, which Tandana helped start, and soon got to work constructing a rock wall to protect a new orchard and planting 300 fruit trees. While in the village, they tried their hands at pounding millet, participated in a church service, learned to dance Dogon-style, and had their feet or hands tattooed with henna. The joy, friendships, and lessons the people of Kansongho shared with our group were deeply inspiring, and the volunteers have returned home with many ideas of ways to continue to help the village and a new perspective on life. Throughout the month of July 2009, Tandana offered free English and math classes for elementary and secondary students in Quichinche, Ecuador. About 80 students showed up on a daily basis for English classes, taught by Tandana intern Lauren Armstrong and Putney Student Travel volunteers. About 30 students attended math classes, taught by local teacher Alfredo Flores. In addition to classes, the students also participated in service projects and field trips, including cleaning up trash at the sacred Lechero tree, picnicking at the Peguche waterfall, and planting flowers at the Quichinche school. Many of our 45 scholarship students participated and enjoyed the opportunity. "This class helps us a lot with the English language," said Rupay, a scholarship student from Panecillo. In September 2009, Tandana held its sixth round of Health Care Volunteer Ventures. The two groups of volunteers were able to see 359 patients in seven communities outside of Otavalo, treating them for parasites, h. pylori, respiratory infections, and many other diseases. They also enjoyed making bread with a local family, riding bikes down the mountain from Mojanda Lakes, sharing fish and soccer with local families at Yahuarcocha, practicing their Kichwa, and boating on San Pablo Lake. An Ecuadorian medical student was among the volunteers, increasing the cross-cultural sharing for everyone and having a blast discovering new parts of his country. "All the smile and strength that you have is admirable," he said. March 2009 saw four Tandana groups visit Ecuador. Our first benefit group enjoyed a wonderful tour, featuring world-class Pakacuna gardens, Haciendas Cusin and Pinsaqui, colonial Quito, a meeting with Tandana scholarship students, and visits to a community-run native tree nursery, a master weaver, and leather and woodcarving craft towns. They are excited about seeing Tandana's work and the beautiful Andean countryside and are planning to return next year with friends and relatives. Next came three weeks of health care, two for Tandana's Health Care Volunteer Ventures and one for a group of faculty and students from the University of Utah Medical School. They treated 566 patients in 12 communities for everything from headaches to h. pylori or infected wounds. The volunteers enjoyed working in some gorgeous locations on steep hillsides high in the mountains and also visiting waterfalls, discussing bilingual education, listening to local music, learning about traditional healing from a yachac, and picnicking with local friends at Cuicocha volcanic lake. In January 2009, The Tandana Foundation coordinated its first two volunteer programs in Mali. The first was a 3-day service project for a group organized by Women Worldwide and Adventures in Rock. In between travels through the country and enjoying the music of the Festival in the Desert, this group took time to give back to the Kori-Maounde primary school. Volunteers helped the community members and children dig holes and plant 54 fruit trees in the school garden. The children will care for the trees and sell their fruit to earn money for school supplies. The volunteers also helped the community members dig a trench, lay a pipe, and create a watering basin, so that the children can water the trees more easily. They found time to play frisbee with the kids, teach them "head, shoulders, knees, and toes," and lead them with call-and-response to a water hole to bring water for the trees. They also visited a nearby historic site where the community member's ancestors hid from their adversaries in cave dwellings and an old iron smelter. In the evenings, they gave English lessons to middle school students at a dormitory. You can read a great description of their experience at Craig and Steph's Vacation Blog. Next, Tandana's Mali Volunteer Venture group arrived. We had a wonderful, diverse group of travelers who really appreciated every opportunity and enjoyed sharing their insights with each other. After traveling from Bamako, catching a bit of music in Segou, and making mudcloths and visiting artisans in Djenne, they hiked down the Bandiagara cliff to Tereli, where they visited the school and its garden that was funded by Tandana. Next, they went out to the village of Kansongho, where the whole group was blown away by the reception they received. Rifle shots, singing, dancing, Dogon masks, speeches, gifts, and skits marked the inauguration of the well Tandana helped to restore last year and also the celebration of our group's arrival. The village had already begun construction of the building for the new grain bank, and the volunteers pitched in, carrying rocks, drawing water and bringing it from the well, and plastering the interior with mud. They also helped to build anti-erosion dikes in the fields, hoe up the old millet stalks to prepare for next year's planting, and collect firewood for cooking. While in the village, they tried their hands at spinning and weaving, participated in a church service, learned to dance Dogon-style, helped with cooking, and, for some, had their feet tattooed with henna. The joy, friendships, and lessons the people of Kansongho shared with our group were deeply inspiring. The village is thrilled to be starting the grain bank. They have elected the committee that will manage it, and the first shipment of millet has arrived. Before the group left, the chief of Kansongho made a gift of a plot of land to The Tandana Foundation. You can read more on the arts foundry blog. In other good Mali news, Julie and Mick, who participated in the Mali Volunteer Venture returned to their community and raised over $7000 to purchase more millet for the Kansongho grain bank. The bank's managing committee received this news as a miracle; they have already sold over half of their original stock and knew they would run out before the next harvest. The community members and their relatives in the cities were very worried about how to feed their families through the year. Aware of the global economic difficulties, they did not expect such a boon in this time. They are thrilled and so grateful for the additional 16 tons of millet that will be added to the bank's stock. In February 2008, The Tandana Foundation coordinated a weeklong village stay and service project in highland Ecuador for The Traveling School. Students and teachers lived in the homes of families and shared in daily activities in the village of Agualongo. They taught English to the local children and helped build a new bathroom for the village kindergarten. Meanwhile, they learned to bake bread in a wood-fired oven, hiked to the peak above the village, visited Cuicocha Lake with their hosts, and danced with the village in their going-away ceremony. Then, in March, Tandana hosted its third and largest round of health care volunteer ventures. Three groups of volunteers, working different weeks, provided health care to almost 600 patients in 14 communities. The volunteers formed powerful teams working together to serve the patients and also found time to enjoy making local friends, Holy Week activities, eating fanesca soup, visiting with a local shaman and intercultural education leaders, and dancing with a local band. From June 25 - August 7, 2008, the Tandana Foundation held its first Ecuador Summer Volunteer Program. Volunteers lived with indigenous families in a small community near Otavalo, Ecuador. Work projects included teaching summer school English classes to students in the community, assisting public health workers in administering vaccinations to children and dogs, and translating a book of traditional Quichua legends into English. Volunteers also took part in the indigenous celebration of Inti Raymi, visited a sacred waterfall, hiked around Cuicocha Lake, shopped in the world-famous Otavalo market, and learned how to prepare several traditional indigenous dishes. For the final week of the program, volunteers ventured to the Amazon, where they stayed in a jungle lodge, viewed wildlife, and went hiking and river rafting. In September, 2008, The Tandana Foundation hosted its fourth round of Health Care Volunteer Ventures. Volunteers from all over the United States joined with Ecuadorian professionals to offer affordable, accessible, and respectful health care to five communities in the Quichinche parish of Ecuador. This time, we added dentistry to our services, and that was a big hit. We were able to fill cavities for 55 patients. Our doctors and P.A.s, meanwhile, saw 427 patients, helping cure them of H. pylori, parasites, infections, and many other problems. It was a wonderful experience for the volunteers, also, who got to experience baptism celebrations, hikes with our scholarship students to beautiful locations, and meetings with fascinating community members. Meanwhile, in Mali, work began on the new school garden at Tereli. This is the second school garden that Tandana has funded, and it will allow the students to grow fruits and vegetables, learn about horticulture, and also become more self-sufficient as they sell the produce to earn money for school supplies. A fruit tree nursery was also begun for the Kori-Maounde school garden, which Tandana helped to start last year. The well restoration project in Kansongho was completed, and the villagers are thrilled to have a secure, year-round water source. In February 2007, The Tandana Foundation coordinated a weeklong village stay and service project in highland Ecuador for The Traveling School. Students and teachers lived in the homes of families and shared in daily activities in the village of Agualongo. They taught English to the local children and helped the community pave a muddy area next to the community center. Meanwhile, they also learned to peel potatoes, hiked to the peak above the village to take in the amazing Andean landscape, celebrated Carnaval by joining in a huge water fight, and gained new "parents, brothers, and sisters," whom they can't wait to visit again. Then, later in March, a group of adults traveled to Ecuador to provide healthcare for underserved villagers. They saw hundreds of patients in four communities and also found time to experience the culture and area in amazing depth for a visit of just one week. They met with traditional healers, indigenous leaders, students, and a master weaver and hiked to sacred sites such as the Lechero tree and the Peguche waterfall. Throughout their stay, they reveled in the opportunity to interact as friends rather than tourists and to take in the region's natural beauty. In September 2007, a second group of volunteers traveled to Ecuador to provide health care to rural villagers. They saw hundreds of patients in five communities and enjoyed working with local professionals, meeting with community members, and taking in the amazing natural beauty of the Andes. Building on our experience in March, we improved our techniques in this second health care volunteer venture, creating better patient records and strategies for organizing our pharmacy. We have also begun work in Mali, where we have funded the creation of a school garden and the reconstruction of a well. We hope to offer volunteer vacations and service projects there in the future. Correspondence programs and sister city or school relationships are also available, and we are working on a Malian folktale book project that will benefit the village of those who shared the stories with us. In 2004, The Tandana Foundation was begun with the goal of promoting cross-cultural learning opportunities and service projects. Operating under the auspices of the Deer Hill Foundation, in July 2005 we were able to include two Ecuadorian participants in the Deer Hill Expeditions Expedicion Ecuador program, allowing them to travel around their country with North American students and then host these new friends in their village as they all worked together on community projects. It was an experience that still resonates in their hearts; Claudia, one of the local scholarship recipients, recently sent an email saying, "I wrote like a book about the trip and this year I reread it, saying last year I was there and there.... this is something unforgettable that I have experienced and I will never experience it again. Thank you so much again for everything." We were also able to provide partial scholarships to several North American students, enabling them to participate in this exciting program and experience Ecuadorian culture as few visitors are able. In the summer of 2006, we offered two Ecuadorian students the once-in-a-lifetime opportunity to travel to the United States and participate in Deer Hill's Canyon Country program. Cristina and Elsa, who had never dreamed they would travel on an airplane, flew from Quito to Houston, Denver, and then Cortez, Colorado. Smiling in the sun in their traditional Otavelena dress, they awaited my pickup and the adventure of their lives. Joining their North American and French groupmates, they set off on a week-long raft trip on the Green River. They loved running the rapids in inflatable kayaks, cooking strange new American foods when it was their turn in the kitchen, and making friends with the young people in their group. After hiking in the La Sal Mountains and taking in an alpine beauty different from that of their Andean home, they journeyed to the village of Lower Moencopi on the Hopi Nation, where they encountered the highlight of their trip. Both they and the Hopi hosts were thrilled with the opportunity to share customs, traditions, and techniques with people of another indigenous American culture. Corn is central to the lifestyles of both, and they traded beliefs, processing techniques, and favorite dishes related to that crop. During our stay there, Lower Moencopi was also visited by Native Youth Cultural Exchange, a group of Native Hawaiian, Californian, and Hopi youth. Cristina and Elsa were able to join the young people from each of those cultures in presenting songs, dances, and traditions from their homeland at a cultural exchange potluck. Their experience in the United States not only gave them a chance to learn about other cultures and make new friends, it also helped them value their own culture more, enlarged their perspective on the world, and gave them experience that will help in their future careers in the tourism industry in Ecuador. After the trip, Cristina wrote, "I am so happy and grateful to all of those who made possible my dream. I had many wonderful experiences, I learned to converse in English, and I also got to know the Hopi culture, in which they have conserved many of their ancestral traditions. I learned to value my culture... I know that this experience will serve me in my professional and personal life, because my dream is to become a professional tourism guide. This experience was a great practical and observation trip and I learned much more than I have in the classroom." The other members of their group also enjoyed and benefited from the opportunity their presence offered to form cross-cultural friendships and learn about a different perspective. In addition to making possible these amazing experiences for Cristina and Elsa, we were also able to coordinate a week-long village stay and service project for The Traveling School and a month-long volunteer vacation for a family from Montana. The Traveling School students and teachers stayed with host families in the village of Agualongo, taught English to the local children, helped the village paint their community center, played soccer with the mothers, and were amazed by the appreciation feast they were offered. The week there was a highlight of their three-month journey through the Andes because of the unique opportunity it offered for real cultural experience, friendship, and the chance to make a difference. Then, in June, a family of four from Montana journeyed to Ecuador and stayed with a family in the community of Rey Loma. They joined in festival activities with their hosts, supported the community soccer team, helped a school replace a badly-damaged roof, prepared Elsa and Cristina for their trip to the United States, and experienced so much that a typical visitor would never see.